Our bungalow homes, all on expansive 70’ lots, offer two to four-bedroom designs ranging in size from 1,595 to 2,863 square feet with an optional loft. With multiple benefits to suit countless lifestyles, our bungalow designs offer the ultimate in privacy, open concepts layouts and bright natural light, expanding the line of vision throughout the home. Our architecturally designed streetscapes and elevations only complement the natural beauty surrounding the community. Home interiors include coffered, waffle or cathedral ceilings, large covered porches, spacious foyers, generous walk-in closets, and custom quality kitchens opened to the family room. For many, bungalows offer the perfect opportunity for open concept living in a one-storey floorplan that is ideal for their daily life. 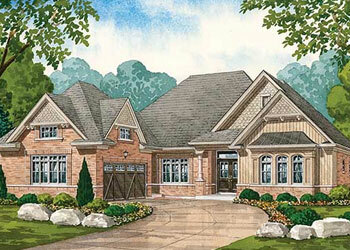 Come in today and explore our exquisite bungalow designs at Riverbend Estates!